Session 3 of the 2017 Pac-12 Men's Basketball Tournament tips off on Thursday, March 9, at 12:00 p.m. Pacific Time in Las Vegas at the T-Mobile Arena with the first two of four quarterfinals matchups. The tournament's top seed, the Oregon Ducks, will play in the first quarterfinal against the winner of Session 1's game between Arizona State and Stanford. In the second quarterfinal of Session 3, the Utah Utes face the winner of the California-Oregon State matchup from Session 1. The winner of the tourney will earn the conference's automatic bid to the NCAA Tournament, although the Pac-12 hopes to place as many as six teams in March Madness this year. The Ducks are both the top seed in the event and the defending tournament champions, although the Arizona Wildcats and the UCLA Bruins also are highly ranked in the national polls and should put up a strong fight for the Pac-12 Tournament Championship. The Ducks have been flying high all season, starting out in the Associated Press preseason Top 5 and currently ranked No. 6 in the AP poll with a 27-4 record. Oregon has won the Pac-12 Tournament four times since the event's return in 2002, including the 2013 and 2016 championships. No other conference school can match those four titles since 2002, and the Ducks are ready to add a fifth trophy to the school's display case, regardless of which team they face in this quarterfinal matchup. Regular season recap: Oregon was a combined 3-0 against both the Sun Devils and the Cardinal, so whichever team advances on Wednesday afternoon will have its hands full with the Ducks. However, both teams did manage to push Oregon to the limit in the regular season, as the Ducks won at Stanford by only two points on February 25 and only by a single point when ASU came to Eugene on February 2. Despite the overall dominance by Oregon this year, both potential opponents know they can hang with the Ducks. Players to watch: There are five players for Oregon who averaged double-digit scoring this year, which means it's always hard to defend the Ducks. Junior forward Dillon Brooks gets a lot of press, but senior forward Chris Boucher is a real monster on both ends of the court. He averages 12.1 points, 6.2 rebounds and 2.6 blocks per game, and when an opponent has trouble scoring against Oregon, it's usually because Boucher is on his game. The Pick: Despite the close outcomes earlier in the season against both ASU and Stanford, it's hard to pick against the depth and versatility on this Ducks squad. Oregon has been playing under pressure all season, and the Ducks have persevered. They won 17 in a row at one point earlier this year, and Oregon also has won its last six games now, including big road wins against USC and California that helped the Ducks win the regular-season title. Look for Oregon to grind out a win in a tougher-than-it-needs-to-be matchup on Thursday afternoon. The Utes (20-10) are on the NCAA bubble right now, and they need to win this game in all probability to get into March Madness. For a team like Utah that is good but hardly spectacular, that creates a lot of pressure, especially if this quarterfinal matchup is against the Golden Bears. That's because Cal is also on the bubble, making this game a potential elimination game for both the Pac-12 Tournament and the NCAA Tournament selection committee. 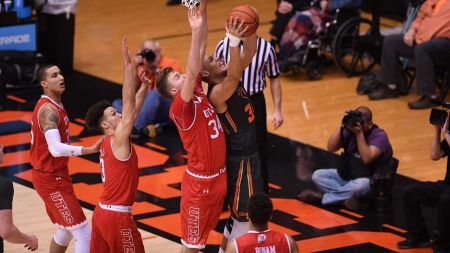 Regular season recap: In an interesting piece of trivia, the only conference game the Oregon State Beavers won this year was against the Utes in Corvallis. As a result, Utah split both regular-season series with Cal and OSU, respectively. However, the Utes lost to the Beavers by one point and lost to the Bears by two points, in overtime. Both games were on the road. At home, Utah beat both teams by a combined 38 points. That kind of disparity in home-road results is something to remember. Players to watch: Junior forward Kyle Kuzma led the Utes in both scoring (16.0 points per game) and rebounding (9.6 rebounds per game) this season, and he almost led the team in assists as well, despite registering only 2.6 dimes per game. While three other players on Utah's roster also averaged double-digit scoring, it's Kuzma that makes this team dangerous. The Pick: Those home/road splits are interesting because this game will be played in Vegas. You can bet a lot of Utes fans are coming down to see their team play well. Vegas is not that far from Salt Lake City, after all. Cal and Oregon State were a combined 4-23 away from home this season, and Utah did manage a decent 6-7 record away from home themselves. The traveling Utes fans are going to be enough to give Utah a boost in this game, which probably will be against a good Bears team, and help carry the Utes to Friday's semifinal action.